The Pentax C61215KP is a monofocal, manual iris, C-mount lens designed for 1/2-inch CCD industrial cameras. This lens has a fast f/1.2 aperture for excellent low-light images. The 12mm focal length lens covers more than 30°. Lockable focus & iris rings prevent movement during vibration and shock. 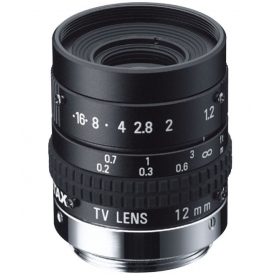 Did you see a lower price for the Pentax C61215KP 1/2" format 12mm f/1.2-22 C-mount Lens with Lock Screws? Do you have a question about the Pentax C61215KP 1/2" format 12mm f/1.2-22 C-mount Lens with Lock Screws?